In the spring of 1774, the British Parliament was debating the Intolerable Acts, as a response to the latest conflicts with the American Colonies—the Boston Tea Party in particular. On April 19, Rose Fuller moved that the tea tax be repealed. 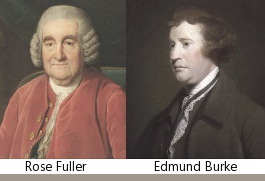 Edmund Burke delivered a speech in support of the motion. Excerpts appear below. The speech was more than twenty pages long and Burke had to pause at least once to recover his voice (full text of the speech). Sir,—I agree with the honorable gentleman who spoke last, [Charles Wolfran Cornwall, who opposed the motion] that this subject is not new in this House. Very disagreeably to this House, very unfortunately to this nation, and to the peace and prosperity of this whole empire, no topic has been more familiar to us. For nine long years, session after session, we have been lashed round and round this miserable circle of occasional arguments and temporary expedients. I am sure our heads must turn and our stomachs nauseate with them. We have had them in every shape; we have looked at them in every point of view. Invention is exhausted; reason is fatigued; experience has given judgment; but obstinacy is not yet conquered. He desires to know, whether, if we were to repeal this tax, agreeably to the proposition of the honorable gentleman who made the motion, the Americans would not take post on this concession, in order to make a new attack on the next body of taxes; and whether they would not call for a repeal of the duty on wine as loudly as they do now for the repeal of the duty on tea. Sir, I can give no security on this subject. But I will do all that I can, and all that can be fairly demanded. To the experience which the honorable gentleman reprobates in one instant and reverts to in the next, to that experience, without the least wavering or hesitation on my part, I steadily appeal: and would to God there was no other arbiter to decide on the vote with which the House is to conclude this day! When Parliament repealed the Stamp Act in the year 1766, I affirm, first, that the Americans did not in consequence of this measure call upon you to give up the former Parliamentary revenue which subsisted in that country, or even any one of the articles which compose it. I affirm also, that, when, departing from the maxims of that repeal, you revived the scheme of taxation, and thereby filled the minds of the colonists with new jealousy and all sorts of apprehensions, then it was that they quarrelled with the old taxes as well as the new; then it was, and not till then, that they questioned all the parts of your legislative power, and by the battery of such questions have shaken the solid structure of this empire to its deepest foundations. Of those two propositions I shall, before I have done, give such convincing, such damning proof, that, however the contrary may be whispered in circles or bawled in newspapers, they never more will dare to raise their voices in this House. I speak with great confidence. I have reason for it. The ministers are with me. They at least are convinced that the repeal of the Stamp Act had not, and that no repeal can have, the consequences which the honorable gentleman who defends their measures is so much alarmed at. To their conduct I refer him for a conclusive answer to his objection. I carry my proof irresistibly into the very body of both Ministry and Parliament: not on any general reasoning growing out of collateral matter, but on the conduct of the honorable gentleman’s ministerial friends on the new revenue itself. Well! but whatever it is, gentlemen will force the colonists to take the teas. You will force them? Has seven years’ struggle been yet able to force them? Oh, but it seems “we are in the right. The tax is trifling,—in effect it is rather an exoneration than an imposition; three fourths of the duty formerly payable on teas exported to America is taken off,—the place of collection is only shifted; instead of the retention of a shilling from the drawback here, it is three-pence custom paid in America.” All this, Sir, is very true. But this is the very folly and mischief of the act. Incredible as it may seem, you know that you have deliberately thrown away a large duty, which you held secure and quiet in your hands, for the vain hope of getting one three fourths less, through every hazard, through certain litigation, and possibly through war. Could anything be a subject of more just alarm to America than to see you go out of the plain highroad of finance, and give up your most certain revenues and your clearest interest, merely for the sake of insulting your colonies? No man ever doubted that the commodity of tea could bear an imposition of three-pence. But no commodity will bear three-pence, or will bear a penny, when the general feelings of men are irritated, and two millions of people are resolved not to pay. The feelings of the colonies were formerly the feelings of Great Britain. Theirs were formerly the feelings of Mr. Hampden, when called upon for the payment of twenty shillings. Would twenty shillings have ruined Mr. Hampden’s fortune? No! but the payment of half twenty shillings, on the principle it was demanded, would have made him a slave. It is the weight of that preamble, of which you are so fond, and not the weight of the duty, that the Americans are unable and unwilling to bear. But will you repeal the act, says the honorable gentleman, at this instant, when America is in open resistance to your authority, and that you have just revived your system of taxation? He thinks he has driven us into a corner. But thus pent up, I am content to meet him; because I enter the lists supported by my old authority, his new friends, the ministers themselves. The honorable gentleman remembers that about five years ago as great disturbances as the present prevailed in America on account of the new taxes. The ministers represented these disturbances as treasonable; and this House thought proper, on that representation, to make a famous address for a revival and for a new application of a statute of Henry the Eighth. We besought the king, in that well-considered address, to inquire into treasons, and to bring the supposed traitors from America to Great Britain for trial. His Majesty was pleased graciously to promise a compliance with our request. All the attempts from this side of the House to resist these violences, and to bring about a repeal, were treated with the utmost scorn. An apprehension of the very consequences now stated by the honorable gentleman was then given as a reason for shutting the door against all hope of such an alteration. This act, Sir, had for the first time the title of “granting duties in the colonies and plantations of America,” and for the first time it was asserted in the preamble “that it was just and necessary that a revenue should be raised there”; then came the technical words of “giving and granting.” And thus a complete American revenue act was made in all the forms, and with a full avowal of the right, equity, policy, and even necessity, of taxing the colonies, without any formal consent of theirs. There are contained also in the preamble to that act these very remarkable words,—the Commons, &c., “being desirous to make some provision in the present session of Parliament towards raising the said revenue.” By these words it appeared to the colonies that this act was but a beginning of sorrows,—that every session was to produce something of the same kind,—that we were to go on, from day to day, in charging them with such taxes as we pleased, for such a military force as we should think proper. Had this plan been pursued, it was evident that the provincial assemblies, in which the Americans felt all their portion of importance, and beheld their sole image of freedom, were ipso facto annihilated. This ill prospect before them seemed to be boundless in extent and endless in duration. Sir, they were not mistaken. The ministry valued themselves when this act passed, and when they gave notice of the Stamp Act, that both of the duties came very short of their ideas of American taxation. Great was the applause of this measure here. In England we cried out for new taxes on America, whilst they cried out that they were nearly crushed with those which the war and their own grants had brought upon them. But falsehood has a perennial spring. It is said that no conjecture could be made of the dislike of the colonies to the principle. This is as untrue as the other. After the resolution of the House, and before the passing of the Stamp Act, the colonies of Massachusetts Bay and New York did send remonstrances objecting to this mode of Parliamentary taxation. What was the consequence? They were suppressed, they were put under the table, notwithstanding an order of Council to the contrary, by the ministry which composed the very Council that had made the order; and thus the House proceeded to its business of taxing without the least regular knowledge of the objections which were made to it. But to give that House its due, it was not over-desirous to receive information or to hear remonstrance. On the 15th of February, 1765, whilst the Stamp Act was under deliberation, they refused with scorn even so much as to receive four petitions presented from so respectable colonies as Connecticut, Rhode Island, Virginia, and Carolina, besides one from the traders of Jamaica. As to the colonies, they had no alternative left to them but to disobey, or to pay the taxes imposed by that Parliament, which was not suffered, or did not suffer itself, even to hear them remonstrate upon the subject. The first of the two considerations was, whether the repeal should be total, or whether only partial,—taking out everything burdensome and productive, and reserving only an empty acknowledgment, such as a stamp on cards or dice. The other question was, on what principle the act should be repealed. On this head also two principles were started. One, that the legislative rights of this country with regard to America were not entire, but had certain restrictions and limitations. The other principle was, that taxes of this kind were contrary to the fundamental principles of commerce on which the colonies were founded, and contrary to every idea of political equity,—by which equity we are bound as much as possible to extend the spirit and benefit of the British Constitution to every part of the British dominions. The option, both of the measure and of the principle of repeal, was made before the session; and I wonder how any one can read the king’s speech at the opening of that session, without seeing in that speech both the repeal and the Declaratory Act very sufficiently crayoned out. Those who cannot see this can see nothing. It is said, that the disturbances, if there were any before the repeal, were slight, and without difficulty or inconvenience might have been suppressed. For an answer to this assertion I will send you to the great author and patron of the Stamp Act, who, certainly meaning well to the authority of this country, and fully apprised of the state of that, made, before a repeal was so much as agitated in this House, the motion which is on your journals, and which, to save the clerk the trouble of turning to it, I will now read to you. It was for an amendment to the address of the 17th of December, 1765. “To express our just resentment and indignation at the outrageous tumults and insurrections which have been excited and carried on in North America, and at the resistance given, by open and rebellious force, to the execution of the laws in that part of his Majesty’s dominions; to assure his Majesty, that his faithful Commons, animated with the warmest duty and attachment to his royal person and government, … will firmly and effectually support his Majesty in all such measures as shall be necessary for preserving and securing the legal dependence of the colonies upon this their mother country,” &c., &c.
Here was certainly a disturbance preceding the repeal,—such a disturbance as Mr. Grenville thought necessary to qualify by the name of an insurrection, and the epithet of a rebellious force: terms much stronger than any by which those who then supported his motion have ever since thought proper to distinguish the subsequent disturbances in America. Sir, I have troubled you sufficiently with the state of America before the repeal. Now I turn to the honorable gentleman who so stoutly challenges us to tell whether, after the repeal, the provinces were quiet. This is coming home to the point. Here I meet him directly, and answer most readily, They were quiet. And I, in my turn, challenge him to prove when, and where, and by whom, and in what numbers, and with what violence, the other laws of trade, as gentlemen assert, were violated in consequence of your concession, or that even your other revenue laws were attacked. But I quit the vantage-ground on which I stand, and where I might leave the burden of the proof upon him: I walk down upon the open plain, and undertake to show that they were not only quiet, but showed many unequivocal marks of acknowledgment and gratitude. This revenue act of 1767 formed the fourth period of American policy. How we have fared since then: what woful variety of schemes have been adopted; what enforcing, and what repealing; what bullying, and what submitting; what doing, and undoing; what straining, and what relaxing; what assemblies dissolved for not obeying, and called again without obedience; what troops sent out to quell resistance, and, on meeting that resistance, recalled; what shiftings, and changes, and jumblings of all kinds of men at home, which left no possibility of order, consistency, vigor, or even so much as a decent unity of color, in anyone public measure—It is a tedious, irksome task. My duty may call me to open it out some other time; on a former occasion I tried your temper on a part of it; for the present I shall forbear. For my part, I should choose (if I could have my wish) that the proposition of the honorable gentleman for the repeal could go to America without the attendance of the penal bills. Alone I could almost answer for its success. I cannot be certain of its reception in the bad company it may keep. In such heterogeneous assortments, the most innocent person will lose the effect of his innocency. Though you should send out this angel of peace, yet you are sending out a destroying angel too; and what would be the effect of the conflict of these two adverse spirits, or which would predominate in the end, is what I dare not say: whether the lenient measures would cause American passion to subside, or the severe would increase its fury,—all this is in the hand of Providence. A noble lord, who spoke some time ago, is full of the fire of ingenuous youth; and when he has modelled the ideas of a lively imagination by further experience, he will be an ornament to his country in either House. He has said that the Americans are our children, and how can they revolt against their parent? He says, that, if they are not free in their present state, England is not free; because Manchester, and other considerable places, are not represented. So, then, because some towns in England are not represented, America is to have no representative at all. They are “our children”; but when children ask for bread, we are not to give a stone. Is it because the natural resistance of things, and the various mutations of time, hinders our government, or any scheme of government, from being any more than a sort of approximation to the right, is it therefore that the colonies are to recede from it infinitely? When this child of ours wishes to assimilate to its parent, and to reflect with a true filial resemblance the beauteous countenance of British liberty, are we to turn to them the shameful parts of our constitution? are we to give them our weakness for their strength, our opprobrium for their glory, and the slough of slavery, which we are not able to work off, to serve them for their freedom? If this be the case, ask yourselves this question: Will they be content in such a state of slavery? If not, look to the consequences. Reflect how you are to govern a people who think they ought to be free, and think they are not. Your scheme yields no revenue; it yields nothing but discontent, disorder, disobedience: and such is the state of America, that, after wading up to your eyes in blood, you could only end just where you begun,—that is, to tax where no revenue is to be found, to –- My voice fails me: my inclination, indeed, carries me no further; all is confusion beyond it. Now, Sir, I trust I have shown, first on that narrow ground which the honorable gentleman measured, that you are like to lose nothing by complying with the motion, except what you have lost already. I have shown afterwards, that in time of peace you flourished in commerce, and, when war required it, had sufficient aid from the colonies, while you pursued your ancient policy; that you threw everything into confusion, when you made the Stamp Act; and that you restored everything to peace and order, when you repealed it. I have shown that the revival of the system of taxation has produced the very worst effects; and that the partial repeal has produced, not partial good, but universal evil. Let these considerations, founded on facts, not one of which can be denied, bring us back to our reason by the road of our experience. On this business of America, I confess I am serious, even to sadness. I have had but one opinion concerning it, since I sat, and before I sat in Parliament. The noble lord will, as usual, probably, attribute the part taken by me and my friends in this business to a desire of getting his places. Let him enjoy this happy and original idea. If I deprived him of it, I should take away most of his wit, and all his argument. But I had rather bear the brunt of all his wit, and indeed blows much heavier, than stand answerable to God for embracing a system that tends to the destruction of some of the very best and fairest of His works. But I know the map of England as well as the noble lord, or as any other person; and I know that the way I take is not the road to preferment. My excellent and honorable friend under me on the floor has trod that road with great toil for upwards of twenty years together. He is not yet arrived at the noble lord’s destination. However, the tracks of my worthy friend are those I have ever wished to follow; because I know they lead to honor. Long may we tread the same road together, whoever may accompany us, or whoever may laugh at us on our journey! I honestly and solemnly declare, I have in all seasons adhered to the system of 1766 for no other reason than, that I think it laid deep in your truest interests,—and that, by limiting the exercise, it fixes on the firmest foundations a real, consistent, well-grounded authority in Parliament. Until you come back to that system, there will be no peace for England. had listened to Burke and acted accordingly, the 13 Colonies might have stayed a part of the Empire for a longer period of time. If they'd started listening in 1767 and kept on listening... there may never have been a revolution. He was not in favor of independence, I'm told (though I think he argues somewhere that a colony separated by an ocean from its homeland is almost by nature independent), but he wanted to treat the colonists as having all the rights of the local Englishmen. Had that happened, we might all be singing God Save the Queen. On the other hand, America has managed to remain not-quite-post-Christian a good bit longer than UK has.